Dance Marathon programs help kids while competing for Dairy Queen donation and ice cream treats! – Dairy Queen Corp.
Dance Marathon programs help kids while competing for Dairy Queen donation and ice cream treats! All Miracle Network Dance Marathon programs are invited to take part in the #DM4MiracleTreatDay contest on July 27, 2017. 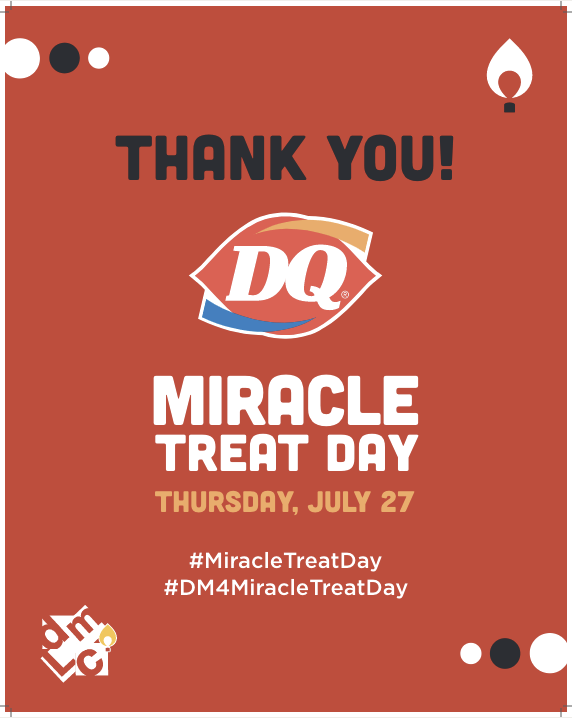 Dance Marathon programs are asked to post a photo celebrating Miracle Treat Day and use both the hashtags #MiracleTreatDay and #DM4MiracleTreatDay to Twitter, Facebook and/or Instagram on July 27, 2017. Each post is a separate entry. The winners will be the posts with the most social media engagement on July 27, 2017. Prizes include cash donations to the children’s hospital that the Dance Marathon program supports and cases of Dairy Queen Dilly Bars for the program. Official Rules. This document (“Official Rules”) contains the official rules, terms and conditions that govern participation in the Children’s Miracle Network Hospitals (“CMN Hospitals”) Miracle Network Dance Marathon Miracle Treat Day Contest (the “Contest”). CMN Hospitals. The Contest is being conducted by CMN Hospitals, headquartered at 205 South 700 West, Salt Lake City, UT 84101. Questions about the Contest may be directed to Kellie Tiner, c/o CMN Hospitals, 205 South 700 West, Salt Lake City, UT 84101. Telephone: (801) 214-7400.
a. With the assistance and support of CMN Hospitals, many colleges and universities have Dance Marathon programs that support one of CMN Hospitals’ member children’s hospitals. b. During the Contest Period, the Dance Marathon program at each college or university is invited to share posts on Twitter, Facebook and Instagram from that program’s official Twitter, Facebook and Instagram accounts on July 27, 2017 to celebrate Miracle Treat Day at Dairy Queen locations across the United States. c. To be eligible, posts must contain a photo celebrating Miracle Treat Day and the hashtags #MiracleTreatDay and #DM4MiracleTreatDay. Posts need to use both hashtags to be eligible. Dance Marathon programs may post as many posts as they want to on Twitter, Facebook and/or Instagram using both hashtags. The Dance Marathon program whose eligible post receives the most likes, comments, and shares/retweets will win a Five Thousand Dollar ($5,000) donation for the children’s hospital that program supports, and twenty-five (25) cases of Dairy Queen Dilly Bars (1,800 bars) for that program’s Dance Marathon. The Dance Marathon program whose eligible post receives the second highest number of likes, comments, and shares/retweets will win a Three Thousand Five Hundred Dollar ($3,500) donation for the children’s hospital that program supports, and fifteen (15) cases of Dairy Queen Dilly Bars (1,080 bars) for that program’s Dance Marathon. The Dance Marathon program whose eligible posts receive the third highest number of likes, comments, and shares/retweets will win a One Thousand Five Hundred ($1,500) donation for the children’s hospital that program supports, and fifteen (10) cases of Dairy Queen Dilly Bars (720 bars) for that program’s Dance Marathon. In the event of any tie, the following rules will apply. a. If there is a two-way tie for first place, the first and second place prizes will be combined and split equally between the two tying Dance Marathon programs and no second place prize will be awarded. If there is a more than two-way tie for first place, the first, second and third place prizes will be combined and split equally between the tying programs and no other prizes will be awarded. b. If there is a second place prize to award and there is a tie for second place, the second and third place prizes will be combined and split equally between the tying Dance Marathon programs and no other prizes will be awarded. c. If there is a third place prize to award and there is a tie for third place, the third place prize will be split equally between the tying Dance Marathon programs. a. Only Dance Marathon programs that raise funds for a CMN Hospitals member hospital in partnership with CMN Hospitals are eligible to win. A Dance Marathon program that benefits another cause or children’s hospital that is not a CMN Hospitals member hospital is not eligible to win. 5. NO PURCHASE NECESSARY. NO PURCHASE OR PAYMENT OF ANY KIND IS NECESSARY TO ENTER THE CONTEST. This Contest is solely to invite Dance Marathon programs to post photos and messages on Twitter, Facebook and Instagram regarding Miracle Treat Day at Dairy Queen. Individuals, including those who interact with those posts by liking, commenting, retweeting or sharing them, are not eligible to win anything of any value. 6. Contest Period. To be eligible, posts must be posted on an official Dance Marathon program’s Twitter, Facebook and/or Instagram feeds starting at 12:00 a.m. Pacific Daylight Time on July 27, 2017, and ending before 12:00 a.m. Pacific Daylight Time on July 28, 2017 (the “Contest Period”). Only likes, comments, retweets or shares during the Contest Period will be counted for purposes of the Contest. After the Contest Period ends, no further engagements will be counted. 7. Donation Presentation. Winning Dance Marathon programs will be notified via email, and the winning programs’ names will be posted on the https://dairyqueencorp.childrensmiraclenetworkhospitals.org/ website. Winners will be announced on July 31, 2017 at 5:00 p.m. Pacific Daylight Time. Prizes for the winning Dance Marathon programs will be awarded at those programs’ next Dance Marathons. 8. Reservation of Rights. CMN Hospitals reserves the right to modify, suspend or cancel the Contest, and any of these Official Rules, at any time if it determines, in its sole discretion, that the integrity of the Contest has been breached or that continuation of the Contest is unreasonable, impracticable or contrary to applicable law or regulation. Any modification to these Official Rules shall be posted to the https://dairyqueencorp.childrensmiraclenetworkhospitals.org/website. 9. Limitation of Liability. CMN Hospitals is not responsible for inaccurate information provided to CMN Hospitals by any participant, or for inaccurate information provided to any participant by any third party. CMN Hospitals is not responsible for lost, late, delayed, incomplete, misdirected or otherwise unreadable posts, regardless of whether due to participant error or failure of any hardware, software, or any other event outside of CMN Hospitals’ immediate control. 10. Final Authority. All decisions of CMN Hospitals are final. 11. Agreement. By participating in this Contest, all participants agree to abide by these Official Rules and any decision CMN Hospitals makes regarding the Contest. CMN Hospitals reserves the right to disqualify from the Contest, and to prosecute to the fullest extent permitted by law, any participant or other person who, in CMN Hospitals’ reasonable suspicion, tampers with the website, the voting process, intentionally submits more than one vote per day per email address, violates these Official Rules, or acts in an unsportsmanlike or disruptive manner. 12. Governing Law; Waiver; Severability. This Contest and the rights and obligations of CMN Hospitals and participants shall in all respects be governed and enforced in accordance with the laws of the State of Utah applicable to contracts made and preformed therein without reference to applicable choice of law provisions. Failure of CMN Hospitals to enforce at any time the provisions of these Official Rules shall not be construed to be a waiver of such provisions or of the right of Sponsor thereafter to enforce any such or other provisions of these Official Rules. Every provision of these Official Rules is intended to be severable. If any term or provision hereof is illegal or invalid for any reason whatsoever, such illegality or invalidity shall not affect the remainder of these Official Rules.